My overall goal is to create one thing memorable. How To Make Tea — 4 steps to making some delightful tea! Longhairs Sandalwood combs — A Advertisement for Longhairs. Coffee Cup — A coffee cup made out of type. Mah Lollipop — That tragic moment when you drop your loli. Paradigm Coffee Effects — Logo design for a made up company. Logo — I made a logo for myself for fun. Ez — A T-Shirt design based on a meme. 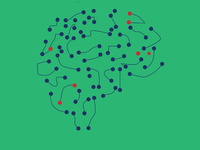 Brain Map — T-shirt Design. Mt Gulug — T – Shirt Design. This is for a local business.